Featuring “Birds” is one of my very favourites. When it came out in 1998, it sounded like no other album I’d heard. Sam Coomes wrote fragmentary, snarky little songs with immediately memorable pop melodies, and then buried them in huge, gunky layers of distorted Rocksichord (a chintzy electronic keyboard from the late 1960s). 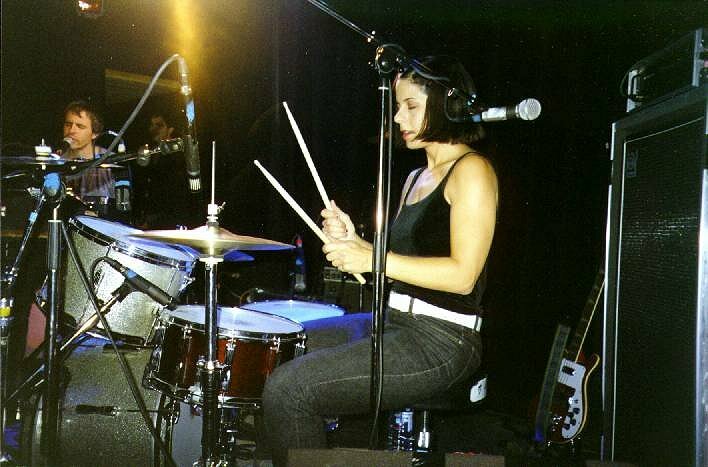 Janet Weiss (Sleater-Kinney’s drummer), meanwhile, played drums with frantic, nervously twitchy energy, but with the confidence to fill every available space in the songs. The album sets out its stall immediately with Our Happiness is Guaranteed. Weiss plays a syncopated pattern with improvised rapid-fire fills while Coomes makes as much noise as possible, segueing into the song proper via a series of tone clusters (there’s a melody in there, but the harmonies applied to it seem to be a result of keyboard mashing) and a brief riff that recurs prior to every subsequent verse. The song, when it begins, is a sci-fi fable with a sing-song melody, which Weiss harmonises sweetly. The whole thing is over in under three minutes. The tension between the group’s melodies and its casual dissonance and sonic aggression made the music thrilling to me, as did the unconventional song structures (many tracks are just a verse and a chorus, or even just a verse on its own) and Weiss’s gonzo drum fills, which sounded like her mind was only a stroke or two ahead of limbs and she didn’t quite know where she was going to go next. The musical tension may well have been fed by personal tension, too; Weiss and Coomes had been married but were already separated by the time of Featuring “Birds”, and as the group were a two-piece, there was no one else to defuse things when they got heated. I imagine the rehearsal studio was an interesting place to be at times. The album is full of songs like Our Happiness is Guaranteed – wonky little tunes that are definitely pop, but that are skewed by Coomes’s sardonic delivery and the group’s full-bore commitment to its sonic aesthetic. I Never Want to See You Again, California (with its hilarious intro: “life is dull, life is gray/at its best, it’s just OK/but I’m happy to report/life is also short”), the surprisingly poignant I Give Up and Nothing from Nothing are all gems, and Please Do shows that Coomes could even rival his friend and sometime bandmate Elliott Smith with an acoustic guitar in his hand and nothing but his fingerpicking to fall back on. Alas, the group couldn’t repeat the trick. Field Studies, from 1999, was a less frantic affair all round, and saw the group diluting its signature sound with more electric guitar and piano, less distorted keyboard, and more bass guitar (courtesy of a guesting Smith). It also saw Coomes’s chippy observations losing their freshness and becoming dulled by his reliance on unvarying end rhyming and repetitive melodic phrases. I checked out after Sword of God, which suffered even more badly from the same problems (and also sounded rubbish, as the group had recorded themselves), and never really picked them up again. But I still come back to Featuring “Birds” and would recommend it unhesitatingly to anyone with any love for 1990s indie. This entry was posted in Music and tagged Elliott Smith, Featuring Birds, Field Studies, Heatmiser, Janet Weiss, Quasi, Sam Coomes, Sleater-Kinney, The Sword of God on January 24, 2018 by rossjpalmer.